JAMB 2019 Recommended Novel for Exam on Use of English – SWEET SIXTEEN (16) – a coming of age story by Bolaji Abdullahi is the recommended Novel for JAMB UTME use of English. We summarized the novel to enable have clue of the novel before your exam day. Our major interest is your success. Try to go through the summary and as well try getting yours to enable you prepare very well. Sweet Sixteen is an indispensable guide for young adults finding their way through the confusing triangle of the big, wide world. It is indeed an interesting story. I know you may be wondering of the number of pages the novel may have. It is just 157 pages which may not take you more than a week to finish. 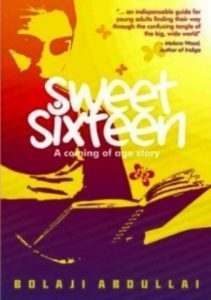 Sweet 16 that succeeds In Dependence was written by Bolaji Abdullahi and was published on 1st February, 2017. The next update will be questions from the novel, Sweet Sixteen you would see on the exam day. Before we show you the summary, Click Here to see New update on Jamb Registration and Requirements and also date for JAMB Exam to enable you prepare ahead of time. If you want to get the book before time you can get it at recommended bookstores nationwide and approved JAMB computer-based centres. In Bolaji Abdullahi’s Sweet Sixteen, the protagonist, 16 year old Aliya, whom her father refers to adoringly as ‘My First Lady,’ bombards her father with questions, some of which threw her journalist father off balance. So there you have it, we wish you success in advance. One of the criteria that propels to getting admission is JAMB. If you can pass your JAMB Examination, consider yourself getting that admission if more efforts will be added. If you score high in JAMB, it gives you encouragement and if the institution uses Screening exercise, you will be admitted. Therefore, the first part you must achieve to enable you gain admission is to score very high in JAMB then wait for Screening or Post UTME. You can as well subscribe to this site using your Email address to get our daily Newsletter on your Email address. Pls Hw can I download d summary or d full book? can i read d novel online? I mistake my Email address in the place of filling instead of shuaibua454@gmail.com, I went and filled shuaibu9454@gmail.com.what should I do?